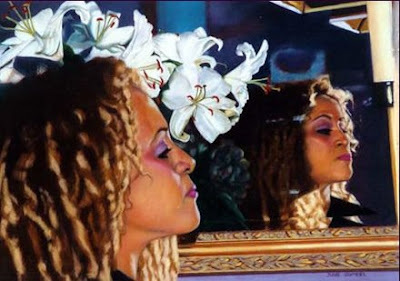 Bio: June Gumbel graduated with a Bachelor of Fine Arts from Louisiana State University, Baton Rouge, where she was born in 1950. Her passion for painting and drawing lead her to further studies at Pierce College in California, Parsons School of Design with Gary Fagin, The Art Students League with Daniel Greene, Everett Ray Kinstler and Nelson Shanks, The New York Academy of Fine Arts with Nelson Shanks and the Scottsdale Artist School with Milt Kobayashi. June is a member of the Salmagundi Club, The Portrait Society of America and The Artist Fellowship of New York. Her studio is in Waccabuc, New York. Subjects: Portraits, landscapes, still life. Gallery: Artwork: Portraits; Landscapes; Still Life (mainly floral); Animals (one painting of a hound, presumably June’s – should be in Portraits really!). thank you for taking the time to compile such a great, informative site! It's a great self-portrait - I love the pose.